Postcards From The Odyssey #7: All In A Day’s Work! What exactly was a day’s work like for a Production Assistant in The Odyssey on Angel Island, you may ask? Due to the epic nature of the production (and likely the fickle will of the gods), Ruth Tringham and Hannah Gaff, Production Assistant Extraordinaires, were never quite sure what they might be required to do on any given day on the island. However, like Odysseus, they were always prepared for an adventure! Those adventures included (but, were by no means limited to) concocting a recipe for blood; creating a set using animal pelts, bones and taxidermy raccoons; translating ancient Greek for a ritual; spray painting props (many, many props) gold; and scaling Mount Olympus to reclaim poor Hermes’ fallen bike helmet. These two intrepid souls, along with the rest of the super cool production team, believed in their brains, brawn, and brilliance to bring this big beauty into being. 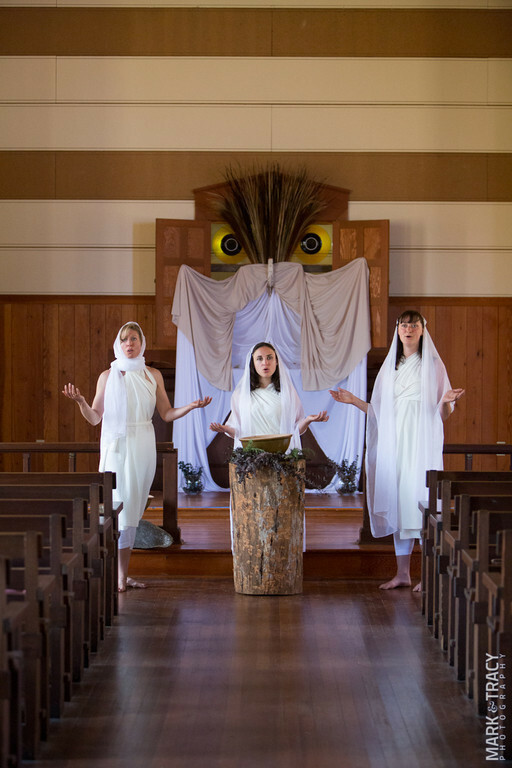 Below, Ruth and Hannah discuss another of their adventures: the conception and construction of an altar to bright-eyed Athena in the Temenos (chapel) on Angel Island. Pictured in front of the altar are Freida de Lackner, Maria Leigh, and Caroline Parsons. Photo by Tracy Martin. Hannah Gaff is a Bay Area actor/creator, clown, and director. She is next appearing in a new work entitled Dirty Laundry created by The Collaboratory, August 9, 10 & 11, 2012 at the Exit Theatre. Ruth Tringham is, among other things, an archaeologist who recently retired as a Professor of Anthropology at UC Berkeley. In another life she would have been a stage designer and hopes still to become a bee-keeper. This entry was posted in Postcards From The Odyssey, Theater Around The Bay, Uncategorized and tagged Alter of Athena, Caroline Parsons, Frieda de Lackner, Hannah Gaff, Maria Leigh, Ruth Tringham, The Odyssey on Angel Island, Tracy Martin, We Players.